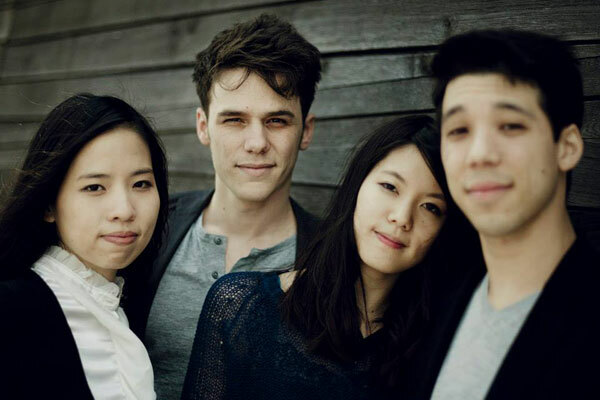 After receiving First Prize at the prestigious Geneva International Competition in 2011, the Hermès Quartet won the Young Concert Artists Auditions in New York in 2012. Since then, a glittering future has beckoned. La Dolce Volta was naturally keen to work with a group so full of delicacy and elegance.‘Daring a youthful approach to the maturity and madness of Schumann’s Quartets op.41.’ This is how the members of the Hermès Quartet describe their approach to the complete string quartets of Robert Schumann. Did the composer himself not embark on writing his quartets as if in an amorous embrace, as passionate as it is ephemeral? In its second disc, the Hermès Quartet gives us a complete recording of them in which musical maturity and bold impetuosity go hand in hand, giving a profound, Romantic reading as powerful as it is sensuous. From the first quartet, influenced by the Classical masters, through the second with its freshness and serenity in a fully emancipated style, to the third in which the composer gives free rein to his unashamed sensibility, the four musicians demonstrate keen musical intelligence, devoid of all striving after effect or distortion of the text: the timbres, the atmospheres, the absolute unity, everything seems natural, almost instinctive, never ‘too much or not enough’. 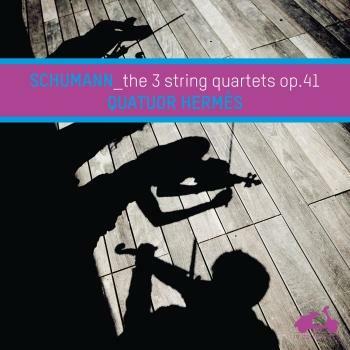 The overall impression one retains from this luminous first encounter between Schumann and the Hermès Quartet is one of total sincerity. Is that not the very essence of what is required to interpret the composer at his most moving? Maturity, sincerity, finesse and intelligence are certainly the most suitable words to describe the Hermes quartet. These qualities, very early noticed by Miguel Da Silva and the Ravel and Ysaÿe quartets, develop and maintain alongside Eberhard Feltz, Artemis Quartet and members of the Alban Berg Quartet. Now, impossible not to be affected by the accomplice sensitivity linking the four musicians. A year after their training at the Conservatoire National Supérieur de Lyon, the first prize at the International Chamber Music Lyon 2009 reveals them, a special prize for their interpretation of "Ainsi la Nuit", Henri Dutilleux (SACEM prize). The charm works again in Geneva (first prize at the International Competiton 2011). At the same time, they are laureates of the Maurice Ravel Academy and the Charles Oulmont Foundation. In November 2012, it's the consecration at the prestigious Young Concert Artist Auditions in New York. The four French win one of the first prizes, which opens the doors of the most beautiful american stages. A great tour in the USA is scheduled for Autumn 2013, but in the meantime, the "windged" quartet continues to travel trough Europe. They performed in the Lockenhaus festival, at the Orangerie de Sceaux, Festival Radio France Montpellier or Crescendo festival in Berlin. Their music has also brought them beyond the borders of Europe, such as Japan and Egypt, great opportunities to share their passion.